Aboriginal and Torres Strait Islanders are advised that the content below contains names of people who have died. Continuing our series on the local counties of the early colony of New South Wales, this post focuses on the county of Narromine. 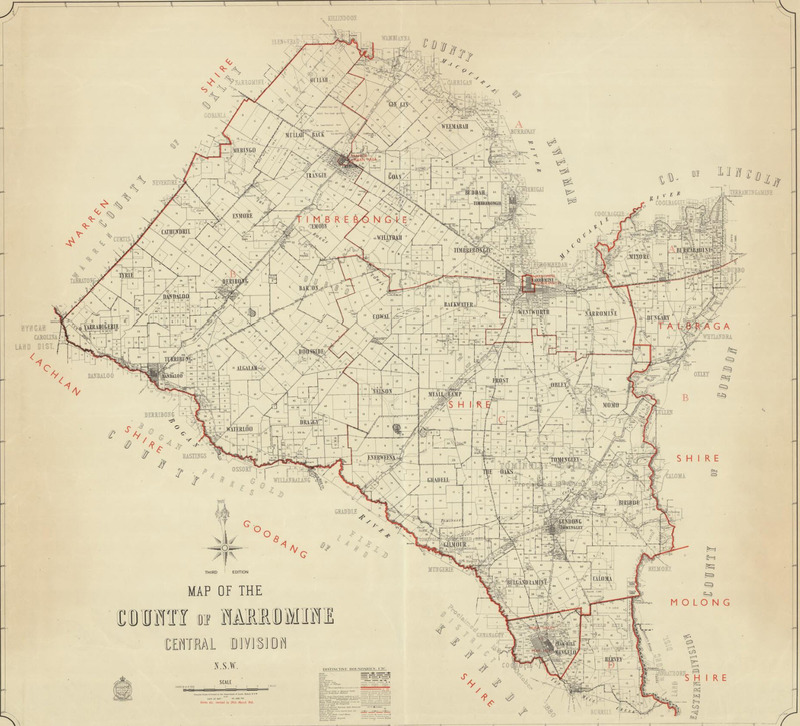 Part of the 141 counties of New South Wales, Narromine was proclaimed a county in 1862 (the same year as Kennedy and Cunningham became counties and twelve years after the establishment of Ashburnham county) (Atchison, J.F. (1980) pages 39-42). There are some differences to the story behind Narromine County to the other three counties that make up the Parkes Shire. 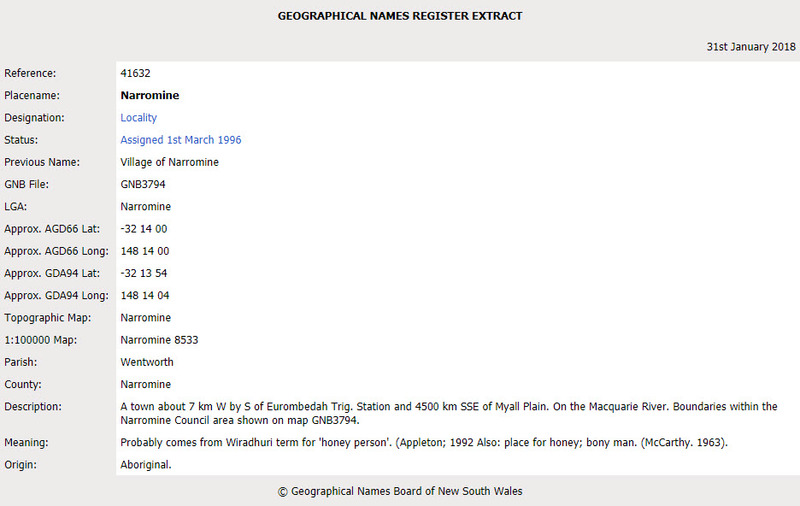 Firstly, Narromine is not named after a person. It is also one of the then growing development to embrace Aboriginal words for places and landmarks. Prior to 1862, all county names were named after Europeans. Some were English aristocrats or military leaders – many of whom never even set foot in the colony (such as Bertram Ashburnham). Later others were Europeans who had impacted the colony of New South Wales in some way – explorers (such as Cunningham and Kennedy), governors or those with prominent occupations that assisted the European settlers here. According to sources, Narromine was a name of a property in the area. This property owners (sadly lost in the mists of time for now) called their property Narromine which was Wiradjuri for “honey person”. This is mentioned on Wikipedia’s entry for Narromine (town) and Narromine (county) as is also found in The Romance of Australian Place Names a feature that appeared in The Australian Women’s Weekly Wednesday 13 May 1964 page 45. 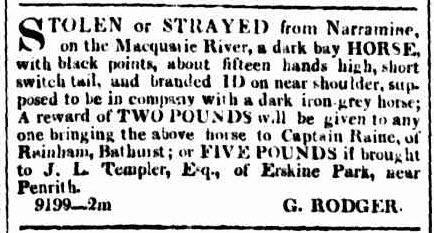 The first mention of Narromine found on Trove was in The Sydney Herald Tuesday 10 November 1840. The report, which can be viewed here, refers to a witness in a cattle theft case. The witness, Mr Arthur Wiggins, had a station at Narromine on the Macquarie. Sadly the article highlights the poor treatment of Aboriginal Australians in colonial days. 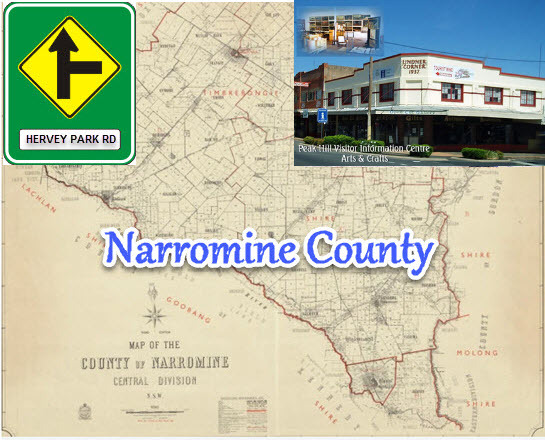 If you have stories of Narromine county that you are willing to share please contact Parkes Shire Library via library@parkes.nsw.gov.au so that they can be shared and kept for posterity on this blog. Alternatively you may leave comments on this page. 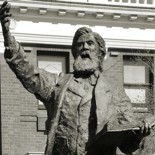 Parkes Shire Council. (2000). 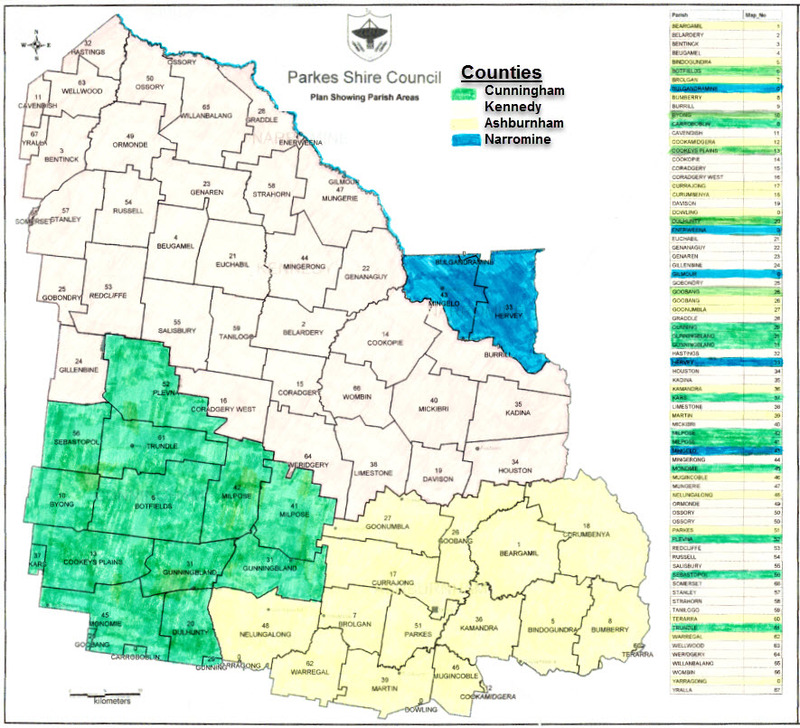 Parkes Shire Council Plan Showing Parish Areas[Map]. Parkes, NSW: Parkes Shire Council. Retrieved January 29, 2018. This entry was posted on February 1, 2018 by parkeslibrary in 1840s, 1850s, Aboriginal, Brief Background to the Maps, Cunningham County, exploration of Australia, General history, Kennedy county, local historical articles, Narromine County, Parkes, Parkes Library Family & Local History Resources, Peak Hill, Settlement in Parkes, Uncategorized, Wiradjuri and tagged 1862, Aboriginal Australians, Arrawatta, Arthur Wiggins, Ashburnham county, Australian Women's Weekly, Baradine, Benarba, Boroondarra, cadastral maps, Caira, Canbelego, Captain Raine, Central Division, colonies of New South Wales, County & Parish Maps of NSW, county of Kennedy, Courallie, Culgoa, Cunningham County, Ewenmar, Geographical Names Board of New South Wales, Gunderbooka, Hervey Park Road, honey person, Irrara, Kennedy, Kennedy county, Kilfera, Killara, Macquarie River, Manara, Menindie, Mingelo Street, Mootwinge, Mossgiel, Mouramba, Nandewar, Narramine, Narromine, Narromine County, parish areas of Parkes Shire Council, parish of Hervey, parish of Mingelo, Peak Hill, Taila, Tandora, Tara, The Sydney Herald, Thoulcanna, Tongowoko, Trove, Trove Australia, Ularara, Urana, wakool, Waljeers, Waradgery, Werunda, Wikipedia, Wiradjuri, Yancowinna, Yanda, Yantara, Yungnulgra.